Virgil van Dijk was educated in the Groningen youth academy before making his first team début. After three seasons the Holland U21 international moved abroad. In June 2013 Van Dijk signed a 4-year contract at Scottish giants Celtic Glasgow for a fee around the 3M€. Van Dijk finally got his long-wished transfer to the Premier League when he signed a five-year deal at Southampton FC at the 1st of September 2015. 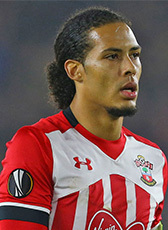 Southampton had to pay a transfer fee of circa 18ME, which made Van Dijk the most expensive Dutch defender since the 25ME move of Jaap Stam from Manchester United to Lazio Roma in 2015. On 27 December 2017 Virgil van Dijk made the biggest transfer in history for a Dutch football player. Around 84ME was paid by Liverpool to Southampton that shatters Liverpool’s previous club record transfer and is also easily the biggest in football history for a defender.